In order to coax roses into producing an abundance of blooms for a stunning summer display, they can be trained in various ways. 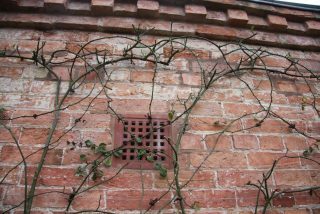 In some gardens, with the most famous example being Sissinghurst Castle, this is done to shrub roses as well as climbers. The aim is to encourage the production of vertical shoots which will be densely covered with flowers. This can be achieved either through a training approach where the main branches are tied in horizontally or, alternatively, by bending the main branches downwards and inwards, resulting in a swirl or circle. While we leave our shrub roses to grow as they please, we do try to maximise the potential of our climbing roses through “bespoke” training. 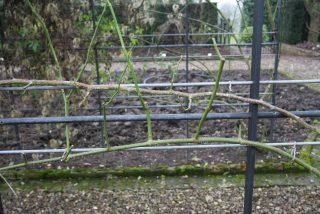 Having experimented with horizontal versus circular training over the last few years, we find that the first approach works best for roses with strong branches and vigorous growth, such as the rambling roses in our Kitchen Garden. Rosa “Violette” and Rosa “Goldfinch” are good examples for this group. 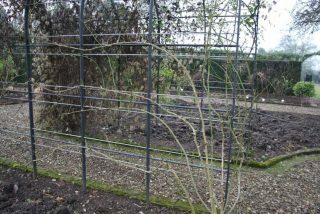 Horizontal training of Rosa “Violette” along an arbour in the Kitchen Garden. In contrast, we find that circular training creates a better display in roses which may be very vigorous, but have more slender branches, such as the climbing rose “New Dawn” and the rambling rose “Adélaïde d’Orléans”. 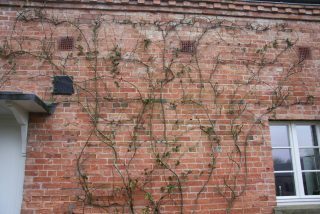 Circular training of Rosa “New Dawn” on the north wall of the Coach House.